A CLEAR AUTO BRA is a thin, clear plastic film that is installed on the front of your vehicle to prevent damage to your paint caused by small rocks, sand, salt and bugs. Once installed it is virtually invisible, and will not peel, crack, or discolor. 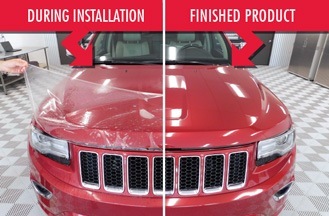 View a short youtube video on how paint protection film works! Larry Millen is the owner, and has been installing paint protection film full time since 2002. He is 3M certified, Solargard certified and XPEL factory trained, and with thousands of kits installed, our company is uniquely positioned to provide you with a combination of the best installations and the finest customer service available. Jennifer Millen owner and logistics manager. Jenn runs the day to day operations. She coordinates the scheduling for our dealership and retail customers. She is also our software expert, and can help you pick the right coverage for your vehicle. In addition to being 3M certified, Solargard certified and Xpel factory trained, Clear Auto Bra Michigan utilizes patterns by Xpel/dap, 3M Digital Designs and Solargard Custom Cut. This allows us to manufacture kits for your vehicle in-house. We cut our kits the day of the installation. No delays, No mistakes! Clear Auto Bra Michigan works with a variety of car clubs, new car dealerships, and the top collision shops in southeast Michigan. 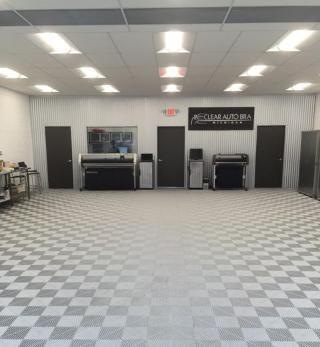 All installations are done at our facility in downtown Plymouth Michigan, within an hour drive of Lansing, Jackson, Flint, Grand Blanc, Toledo and Rochester. Plymouth is a great community and has plenty of shopping and restaurants to visit when you drop off your vehicle for a Clear Auto Bra installation. A clean, well lit environment is critical to achieve a high quality installation. Before you choose an installation facility do your homework. Ask to see their work. This step can not be overlooked! Current model cars should be done using kits (not custom). What brand of Paint Protection Film are they using, and why? We use Xpel Ultimate, Solargard, and 3M Paint Protection films, the leaders in the industry. Our shop does installations for most of the big-name dealerships in the area. We can show you new installations as well as installations that have been done for years. Things to look for: Pealing, dirt filled edges. Misaligned kits. Jagged cuts, dull film, wrinkles, fingerprints and dirt in the film. This is an aftermarket (and very difficult) installation. No job is perfect, but it shouldn't be obvious that it is bad. The following pictures are not my work, but accurately show poor installations. Mercedes hood. This is a bad installation. The paint protection film should follow the lines of the body. These gaps in coverage are not acceptable. The black dots are edges of the film pealing up, Not normal. Dirt filled edges. Top of bumper and below driving light. 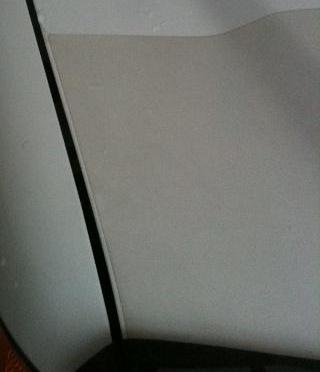 These edges were not "set" during the installation. They will not get any worse, but they still look bad. 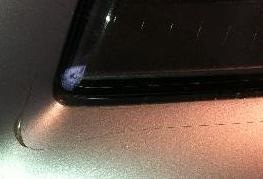 More edges not lined up on a bumper. This could be from a poorly designed kit or a bad installation, or both. Audi A3. Edges not lined up under headlight. This was hand cut on the car (not plotter cut). Corner is pealing. Really bad job! Bad film! This is not 3M , Solargard or Xpel Ultimate Paint Protection Film. This installation was less than 6 months old with an inexpensive film. Notice how dull and dingy the film got. I removed the fender piece for comparison. Paint Protection Film shows up most on white cars. It is slightly discolored right from the start under the right light. It should not look like this under any conditions. White cars do require more maintenance (washing and waxing) to maintain a crisp clean look. We install film on all colors of cars, including white, every week. At this time we are recommending Xpel Ultimate Plus film for white cars.